As the name suggests, dry, shallow fry Okra, stuffed with coriander and other Indian spices makes it more delicious and yummy food. You can easily make this delightful Indian vegetable dish in very quick manner. 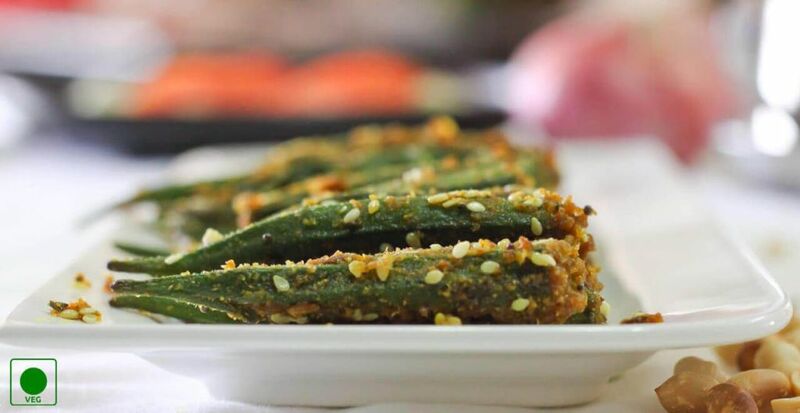 Serve hot stuffed bhindi garnished with coconut powder. Let’s learn the making of stuffed okra/bhindi. 1. In the bowl, add curd, salt, garlic paste, green chili paste, coriander powder, coriander leaves, oil and powdered ground nut and mix them all. You filling for bhindi is ready. 2. Now, take the bhindi and slit them lengthwise without separating the parts. 3. Now, stuff the bhindi with the previously prepared filling. 4. In a deep frying pan, heat the oil. 5. Add sesame seeds, lady’s finger, salt and the lemon juice in the pan. Cover the pan and cook for 5-10 minutes. 6. Uncover and toss the bhindi. 7. Uncover the pan and cook the lady’s finger for 10 minutes on LOW flame, keep tossing a few times in between. 8. Once ready garnish it with coconut powder and serve hot stuffed lady’s finger with hot chapatti. – By adding lemon juice. The lady’s finger retain their original color and do not get sticky. – Lady’s finger should be stuffed and kept aside. – They should be tempered 15 minutes before serving for best results.